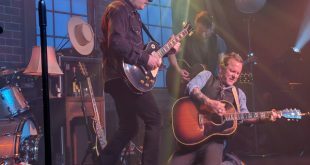 Kiefer Sutherland fans will enjoy seeing the 'Designated Survivor' and '24' actor on tour in advance of his new album. Taken together the tracks on Stuart's 18th studio album form not quite a concept album but a contiguous tapestry of engagement with and love for the idealized West, from the Native American chants on the "Desert Prayer" prologue and the laid-back mariachi flavor and slide guitar licks of the tasty instrumental "El Fantasmo Del Toro" to the mellow-catchy Johnny Cash cloak of "Old Mexico" and the drugged-out haze of the title track. Heard of 'Hee Haw' but don't really know what it its? This three-disc set is a good introduction to the program. Bob Wills in indeed still the king, and Asleep at the Wheel and friends prove it on this perfect tribute album. Plus Adam Lambert, The Who, Smash Mouth, Toad the Wet Sprocket, Esperanza Spalding, The Kentucky Headhunters, Nashville Pu$$y and more. Buck Owens was and is a country legend and now eight years after his death he shares his life with help from Randy Poe and hundreds of hours of his taped stories. Willie Nelson's latest has something for everyone. Twelve artists set Hank Williams' unfinished songs to music, with mixed results.